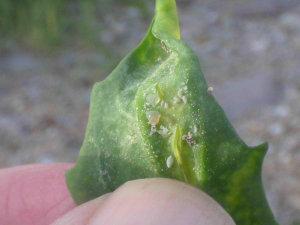 Observation - Aphid gall on Common Orache - UK and Ireland. Description: Thickened rolls in common orache leaves, with waxy aphids. Thickened rolls in common orache leaves, with waxy aphids.